This is the John Hay High School Typewriting Team of Cleveland, Ohio, in 1937. Seated on the far left in the middle row is Stella Pajunas (later Mrs Garnand), a then 16-year-old. 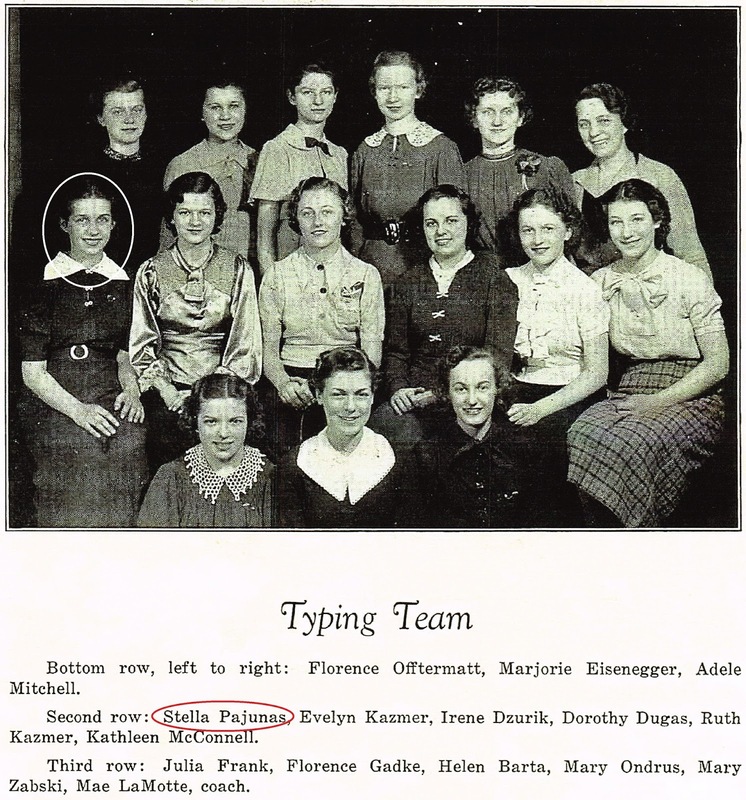 Nine years after this school yearbook photo was taken, in 1946, Stella became the fastest person - to this day - to use a typewriter. 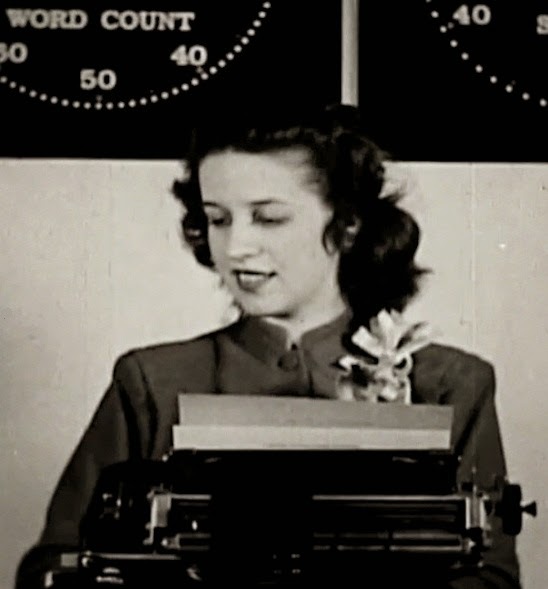 She achieved an average of 216 words a minute on an IBM electric typewriter. I can't help myself, I've got to keep posting on typewriters. It's what gives me the most satisfaction in life. And I can't resist a challenge. Bill MacLaine asked in a comment on my post the other day which had a 1950 film of the Remingtons 1 and 2 in action: "Nice to see the evolution from slow to fast typing. 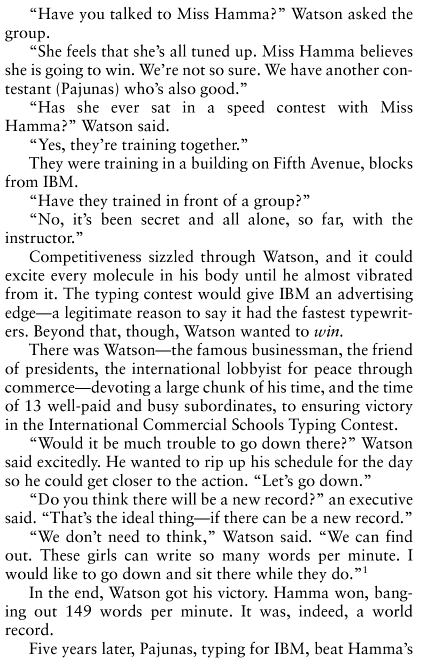 Only one improvement [to the film] would have been if an IBM Selectric was in the clip. I wonder what the top speed was from machine to machine." Late August 1881, McGurrin, 97 words a minute, Walsh & Ford Law Firm, Grand Rapids, Michigan. See Koichi Yasuoka's post here. 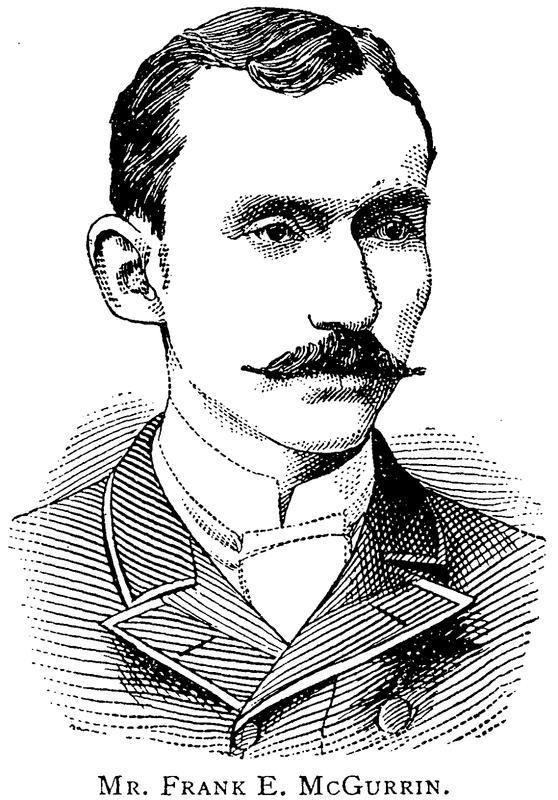 July 25, 1888, McGurrin, 98.11 average words a minute, Palace Hotel Building, Cincinnati, in winning his contest against Louis Taub (Caligraph No 2). 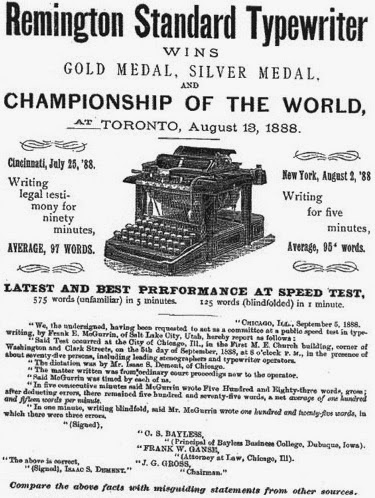 August 13, 1888, Orr, 98.7 average words a minute, Convocation Hall, Toronto, Canada, in winning the international championship from McGurrin. September 4, 1888, McGurrin, 115 average words a minute, First Methodist Church Building, Chicago. (Also reported as 109 words; McGurrin also wrote 125 words in one minute blindfolded). June 20, 1941, Hamma, 149 average words a minute, Goldbatt's Department Store Auditorium, Chicago, in winning the international championship. She beat into second place Albert Tangora, who typed at an average of 142 words a minute, presumably on a manual typewriter (a Royal?). Hamma was reported to have reached a peak speed of 228 words a minute. 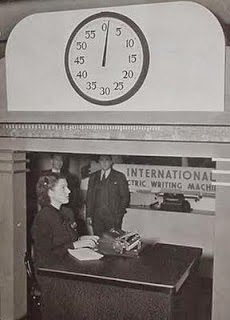 June 19, 1946, Pajunas, 216 average words a minute (average 1080 key strokes a minute), Goldbatt's Department Store Auditorium, Chicago, in winning the international championship (the last one ever held). 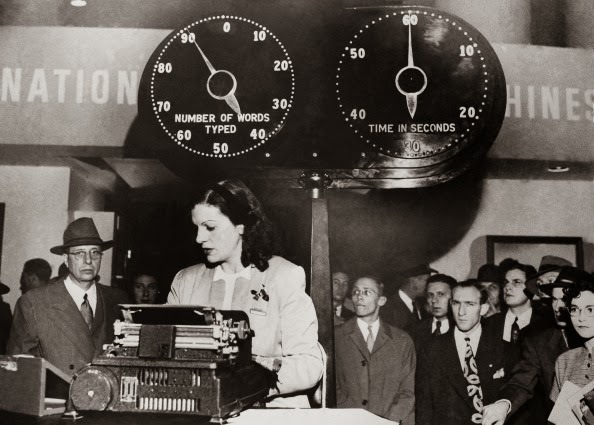 Do you know if that 216 words per minute was an average over a whole hour like the 149 wpm record was? If so, that's over 3 words per second for 3600 seconds. That is absolutely bonkers. I hope she successfully evaded carpel tunnel. Under championship conditions, it's an hour, with deductions for mistakes, which she did make - she thought she'd blown it. She averaged 1080 key strokes a minute. At 64, in 1985, she had MS (diagnosed 1966) but could still type at 140 words a minute. Even with a broken right wrist, at that age, she could type at 80 words a minute. BTW Steve: Stella died in Centerville, Ohio, in February 2007, aged 86. 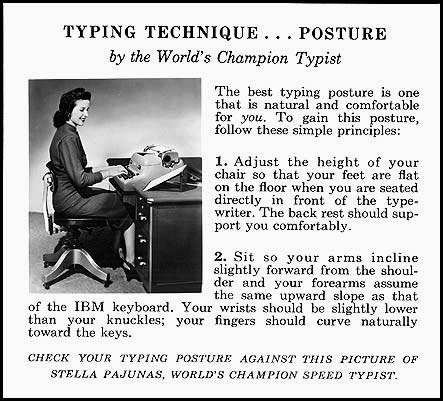 Seems the IBMs were not all that much faster than a good Underwood manual if what is in the Evolution of the Typewriter is correct. There was no mention of speeds over 140 something though. 216 w.p.m. maintained would be something. 80 w.p.m. with a broken hand is a real accomplishment! I know my Underwood office machine is much faster than anything I have Royal included. I'd like to get an SG1 or SG3 for comparison. Bill, I'm certain Hossfield didn't top 150 under competition conditions. 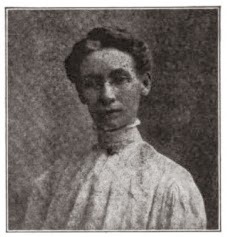 Tangora reached 147 in 1923, before the rules changed. Both he and Hossfield dropped to the low 130s after that. When Hamma beat Tangora in Chicago in 1941, it was stated in reports at the time that his 142 (2nd place, seven behind Hamma with an electric) was one up on his previous world record of 141. I would have to think Tangora's 142 in second place was possibly one of the highest, if not the highest, on a manual under the revised conditions. 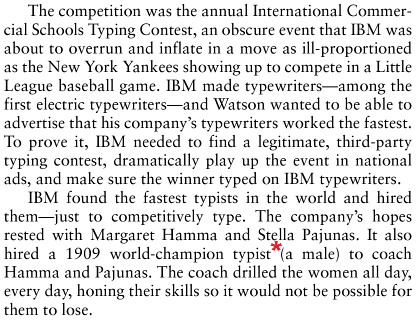 Bill, your point about Underwood is right, but it was IBM which actually killed off the championship for all time by using electrics from 1941-1946. Bill, I'm referring to averaging 142 over an hour under championship conditions (deductions for mistakes). Tangora's 141 was set in winning the 1937 title. In 1959 someone did 176 over five minutes, which I don't think compares - or counts! In 1923 Tangora typed 159 in one minute (that may be where you got the 152 figure for Hossfield, in a post-title "sprint", which traditional for the winner). For me it's a toss-up between Tangora and Hossfield as to who was the greatest, but I lean toward Tangora. I was surprised to find today he was still competing at that level in 1941, and hitting 142, at the age of 38. I never heard of Stella Pajunas before. 216 wpm?? It's superhuman. 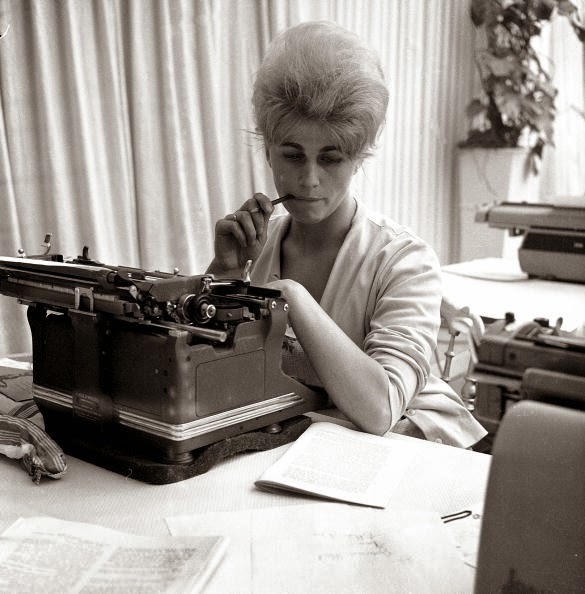 Referring to the photo taken at the 1961 Paris competition, that looks like very awkward ergonomics, with her elbows so low relative to the keyboard of the Underwood. Great typewriter pad, though. I have one like that, came as case "swag" with one of my typers. Must be horsehair, and its thickness absorbs and supports the irregularities of disintegrating feet, even steadying my couple of three-legged cripples. I'm Al Tangora son of the typist. His 142 in 1941 was the fastest on a manual under the one hour conditions and rules. He switched from Underwood to Royal in the late '30s. Electrics were introduced in that '41 contest and the War and the introduction of the electric ended those contests. Hi Al. Great to hear from you. I hope you have read the comments to this post, in which many of these points were made. You will find many other posts on this blog which mention your father. There was even some slow-motion silent footage of him typing in a movie I posted a few weeks ago. Is the world record now held on an electric? If so does it take into account carriage return time? And does it include electronic touch (keyboard) typing?